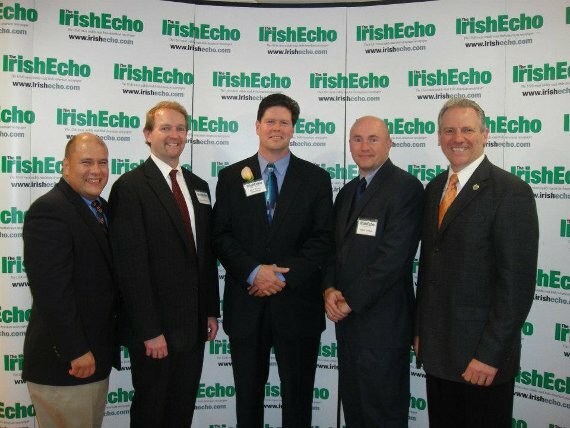 Father Solanus Casey Bergen Division 32 salutes AOH brother John Devine for recently named to the Irish Echo Law and Order Top 50. John received his award at a reception at Irish Consulate in New York City on October 21. Consul General of Ireland Noel Kilkenny and his wife Hanora O’Dea Kilkenny were the hosts of the event. New Jersey State President and AOH National FFIA Chairman Sean Pender, New Jersey State Treasurer Sean Hughes were in attendance along with Mike Breen, and last year honoree’s Jimmy Teehan and Leo McGuire all from Bergen 32.